Florida Gulf Coast University is committed to environmental education and stewardship, and some graduates discover that love and respect for nature can also be a rewarding career when it comes with knowledge. Take Ryan Young, (’12, M.S. Environmental Science), a lifelong outdoors lover from New Jersey who moved to Southwest Florida as a junior in high school. Young not only parlayed his passion for the wilderness into two higher-education degrees (he also has a B.S. in environmental science from Florida State), but the young entrepreneur also figured out how to build his own nature-tour paddling business — Rising Tide Explorers — by making the beautiful flora and fauna around Naples, Marco Island, the Everglades and the Ten Thousand Islands his everyday workplace. 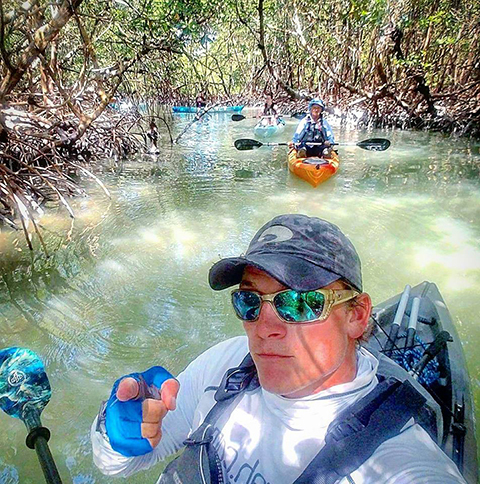 Ryan Young leads a kayak tour through a mangrove tunnel. Photos courtesy of Joey Waves/Island Media Group. In starting his Rising Tide tours through the sloughs and swamps of Collier County, Young has carved himself a nature-trip niche unlike any other in the region by taking guided kayaking adventures to another level. Young and his staff of similarly educated guides turn water adventures into true educational journeys led by biologists with multiple certifications — many of whom are fellow FGCU grads — who share what they’ve learned in the classroom and in the field with locals and tourists paying for the privilege. Rising Tide offers a mangrove tunnel-and-mudflats tour ($65 adults, $55 children) and a sunset bird rookery tour ($75 adults, $65 children) each lasting 2½ to three hours. That’s quite a meteoric rise for an enterprise that started just two years ago, when Young took his last $50 to register as a limited-liability company and started a kayak business — with no kayaks. “I had no idea what to expect,” he said. He took the chance after working three years as a biologist for the state Department of Environmental Protection following his graduate studies at FGCU, doing research on water quality and aquatic vegetation. “There wasn’t a lot of room for growth, and I realized with a master’s degree in environmental science and my experience, there wasn’t anybody as qualified as I was to share information with people,” he said. Young also could draw from his experiences during two summer internships with Corkscrew Swamp Sanctuary in land management and other projects (“I learned a ton from the volunteers; they know everything there is to know,” Young said) and another internship doing sea turtle monitoring and research with Rookery Bay Reserve. Today, that “super team” includes, among others, FGCU grads Jeannine Windsor (’12, Environmental Studies), who is Young’s fiancée, Nick Roach (’18, M.S. Environmental Science), Sarah Norris (’13, Environmental Studies) and Matt Metcalf (’17, M.S. Environmental Science). And the kayak business that started with no kayaks now has 30 single and 14 tandem kayaks, two trailers and two trucks. Rising Tide Explorers also will deliver rental kayaks and paddleboards along with detailed guide maps to a home or vacation spot for do-it-yourself types. And if you can build a business around that passion for exploration, all the better.